Our certified technicians are trained to test for all kinds of indoor air quality issues, ranging from standard mold air sampling to more specific kinds such as HERTSMI-2, VOC and EMMA. Typically, the type of testing needed is determined while on site, as there are many factors that impact indoor air quality and your physiology. Moisture intrusion remains the number one culprit. Homeowners want to know if they have a mold problem, investigators want to find out where the mold is, insurance companies want to know if the mold has been cleaned up and Doctors want to know of exposure to mold. Mold N' More Decontamination is able to test your indoor air quality for hidden mold issues. We can also test any surface using either tape or swab samples. Mold and mold mycotoxins have been scientifically proven to contribute to people's allergic reactions, asthma and chronic sinus infections among many other health issues. When the indoor mold spore count exceeds that of the control (outdoor sample) an underlying mold issue is likely. Surface testing is used to identify the presence of mold and/or a particular mold type. We can also take wall cavity air samples to better pinpoint hidden issues. Mold N' More technicians are trained and certified to conduct the kinds of tests that will determine if levels of mold in the building are above the levels found in the ambient outdoor air. We utilize state of the art equipment to obtain the samples and forward them to EMLab P&K (an independent certified laboratory) for evaluation. Once received, these lab reports are then broken down and discussed in detail with our clients. If necessary, a comprehensive proposal for remediation is written to adequately take care of the issue. The cost of testing varies depending on the number of samples required to evaluate the structure accurately and the type of samples required. A single air-o-cell cassette takes five minutes to collect and covers roughly 1000 square feet (of open space). A minimum of two samples are required as the control (outdoor sample) is needed for comparison. Please call for pricing. In addition to the standard testing to determine air quality and mold exposure levels Mold N' More is able to sample for mold produced mycotoxins. 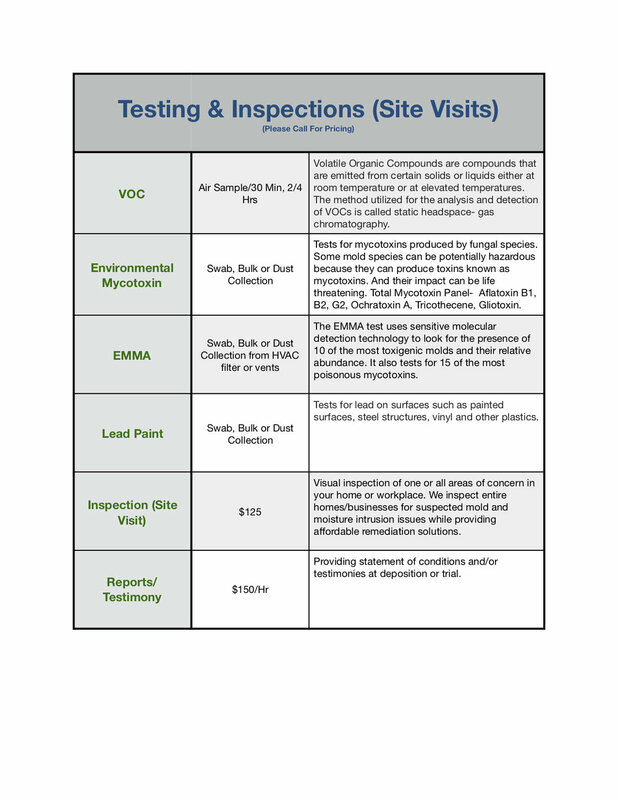 This specialized level of testing goes beyond the identification of mold and mold spores in the air or on surfaces that traditional testing provides. If individuals are symptomatic for a variety of health issues such as Chronic fatigue syndrome (CFS) or similar issues, mycotoxins may be involved. Products and materials present in our homes constantly emit chemicals, called VOCs ( Volatile Organic Compounds) into the air. The slightest elevation in humidity can cause mold to grow anywhere in the home—often in places that go undetected, like behind walls or in carpeting. Exposure to VOCs and growing mold can cause a number of health issues, from headaches to respiratory irritation to asthma exacerbation. Your health could depend on knowing exactly what’s in the air you breathe everyday. 1. Airborne fungal spore concentrations vary greatly over the course of hours, days, weeks and seasons. A sample taken at one moment in time, at one location, may not be representative of typical conditions as indoor air quality constantly changes due to a number of variables. 3. Even air sampling cannot determine the length of time a person has been exposed to a certain type of mold. Testing for mold is utilized to answer specific questions and to assist in the development of a specific remediation plan. This is why we always recommend a full visual inspection by our trained technicians. 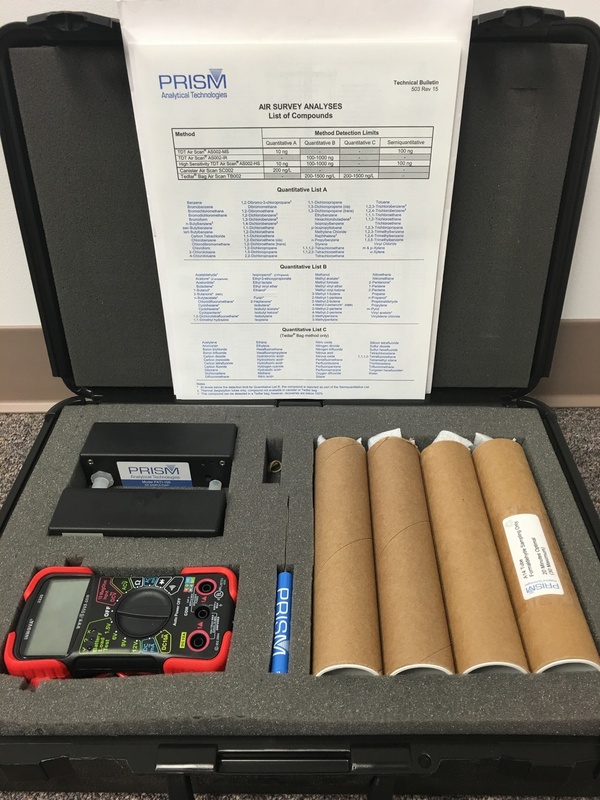 Biological measurements sometimes provide useful information in locating hidden mold where visual inspections prove insufficient. This is especially true when occupants are showing symptoms of allergic response or other health issues related to mold exposure. Comparing indoor air samples with the control (outdoor air quality) can identify hidden mold/CFUs (Colony Forming Units). Its less common but occasionally testing for airborne mycotoxins is needed. Mycotoxins are produced by molds to fend off threats to their spores and are generally produced when there is ample moisture and food for the mold. This is a specialized, greater detailed form of testing (a form of VOC testing) that produces a clear identification of the mycotoxin and its presence in the environment.